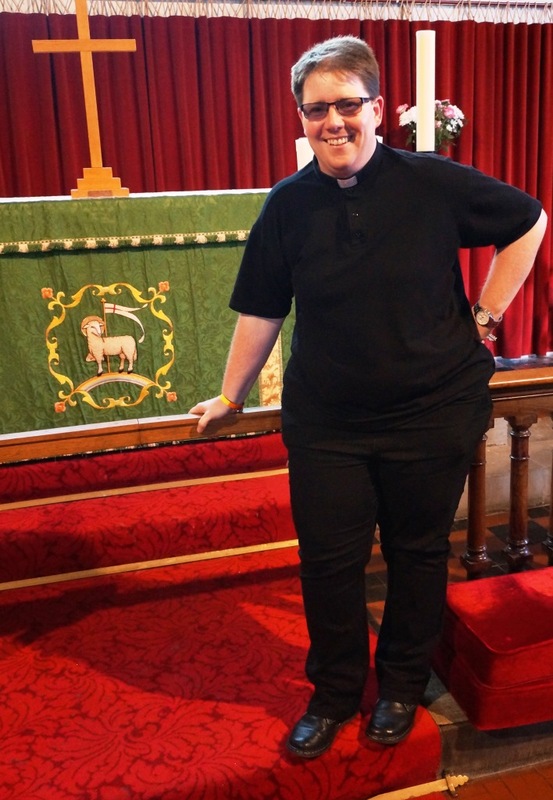 A chaplaincy service for the LGBTQIA+ community is led by the Revd Sarah Hildreth-Osborn based at St Grwst Church, Llanrwst. The Chaplaincy exists because the Christian faith has something to offer everyone including LGBTQIA+ people. However because the Church has caused such hurt to the LGBTQIA+Community over many years we now need to create safe, sacred space, welcome them among us and allow LGBTQIA+people to be who they are, wonderfully created in the image of God and loved just as much as anyone else! Llanrwst Open Table at St Grwst’s Church, Llanrwst will meet on the 3rd Tuesday of every month in 2018. 15 January, 12 February, 19 March, 9 April, 21 May, 18 June, 16 July, 20 August, 17 September, 15 October, 19 November, 17 December. What is an LGBTQIA+ chaplaincy? What sort of support, services or activities will you provide? 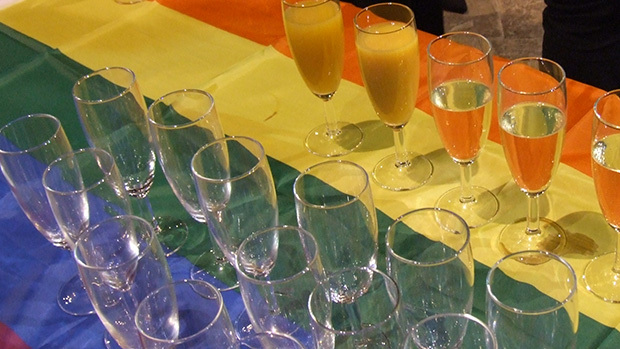 I’m looking to organize a Eucharist specifically for the LGBTQIA+ community at least once a month. Already, St Grwst here in Llanwrst has agreed to be a base for the chaplaincy along with St Peter’s in Holywell and St Giles in Wrexham. The chaplaincy will be holistic in its approach: after each service there will be an opportunity for fellowship, to share stories and learn from each other’s journey of faith. The service is open to everyone and there is information on the diocesan website. Clergy colleagues will be able to refer people to me, especially those seeking information about marriage and blessings. Will you be working alone or will there be other chaplains? 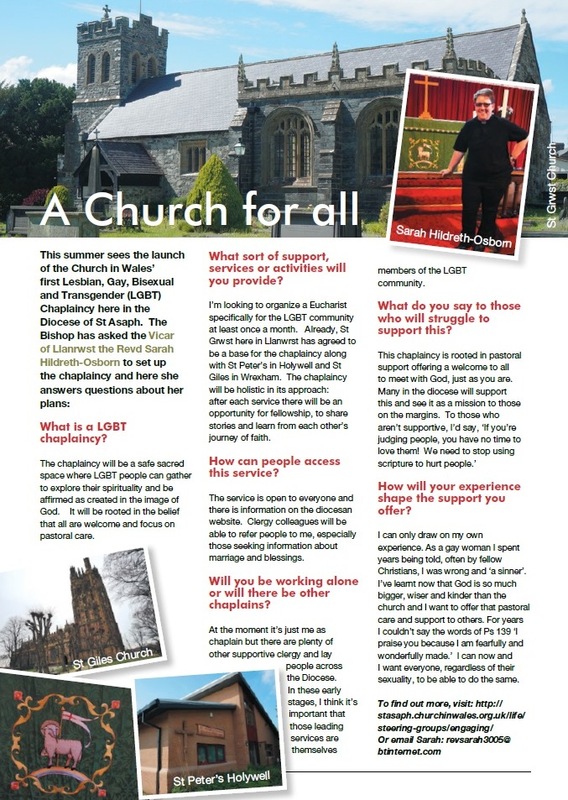 At the moment it’s just me as chaplain but there are plenty of other supportive clergy and lay people across the Diocese. In these early stages, I think it’s important that those leading services are themselves members of the LGBTQIA+ community. What do you say to those who will struggle to support this? How will your experience shape the support you offer? I can only draw on my own experience. As a gay woman I spent years being told, often by fellow Christians, I was wrong and ‘a sinner’. I’ve learnt now that God is so much bigger, wiser and kinder than the church and I want to offer that pastoral care and support to others. For years I couldn’t say the words of Ps 139 ‘I praise you because I am fearfully and wonderfully made.’ I can now and I want everyone, regardless of their sexuality, to be able to do the same. You can contact Sarah by email at revsarah3005@btinternet.com. You can watch the film All One in Christ, made as part of the Iris Prize in the Community.